How Many Clicks Does It Take For Conversions? Is your website losing potential customers? This blog will explain the importance behind minimizing the amount of pages and clicks on your e-commerce website. Making a purchase is like committing to a relationship. It is suppose to be effortless and easy to click; however, there is always hesitation. Let’s face it, our customers do not want to jump through hoops to make a commitment and confirm their purchases. The simpler the process of purchase, the better it is. Ready Artwork will explain to you how businesses can convert online sales and increase their click through rate. According to Jeffrey Zeldman’s “Three-Click Rule”, businesses need to understand the way people use the web, and in this case, the importance of the check out page. By knowing this “rule”, we can understand how to create landing pages that appeal to the customer and are user-friendly. An important key factor for businesses to pay attention to is the amount of clicks it takes for someone to purchase a product on the checkout page. If there are more than a few clicks required to get to the shopping cart or “confirm purchase” page, you will lose a potential customer. According to Bizreport, 77% of shopping carts were abandoned in the last six months. 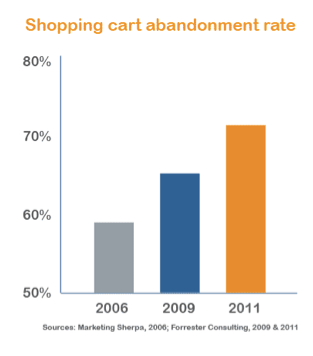 The impact of shopping cart abandonment should not be ignored! Sometimes less is more, and in this scenario it applies to your shopping cart. When a customer enters your website, the suggested number of clicks it takes to navigate and search for information is no more than three mouse clicks. It is based on the belief that customers will become frustrated and often leave if they cannot find the information they need within three clicks. This is one of the few reasons why optimizing your landing page and check out page is important for website optimization. Why do individuals focus so much on being ranked in the top three on Google’s Search Engine Results Page? It is because people usually click no more than three times to find what it is they are searching for. 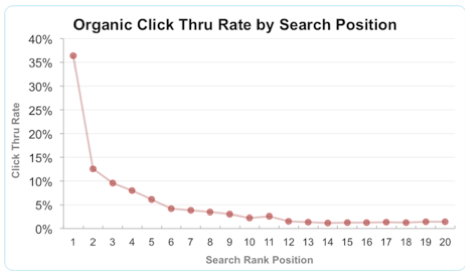 Statistics state that the top three spots on Google get 58% of clicks. Three is the lucky number! To ensure the success of clicks, businesses need customers to feel at ease while shopping around. Adding items into a shopping cart should be non-committal and effortless. After all, customers are putting items into their shopping carts for possible future purchases. When customers are required to click a “BUY” or “PURCHASE” button to add an item to their carts, it is often unsettling for them since they are not necessarily ready to buy the item at the moment. They just want to place it in their shopping carts. Buying is the final step in the shopping experience and it should not be presumed that adding an item to the cart is a commitment to buy. While developing a site for your business, it is important to make your “clicks” efficient. Here at Ready Artwork, we offer services such as Search Engine Optimization (SEO) and web site development. We live by the three click rule and know how to make every click count. Contact Ready Artwork today to optimize your business before the holidays!